A 32-year-old man presented with ptosis since childhood and visual impairment since the age of 29. Examination is shown in the video, found here. He also had mild proximal weakness. Ophthalmological examination revealed pigmentary changes in the retinas. ECG revealed prolonged PR interval. CPK level was 334 U/L. EMG revealed proximal myopathic changes. 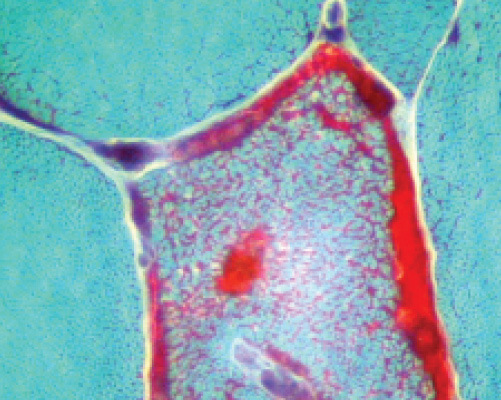 Left biceps muscle biopsy is shown below (Modified Gomori Trichrome stain; 400X). 1. A large mitochondrial deletion in muscle tissue. 2. A large mitochondrial deletion in the while blood cells. 3. A deletion in nuclear mitochondrial genes such as POLG. 4. A point mutation in the mitochondrial genome. 5. Twinkle gene mutations in ocular muscles. Case selected from Dr. Shaibani’s Video Atlas of Neuromuscular Diseases, now available from Oxford University Press. Aziz Shaibani, MD, FACP, FAAN is Director of Nerve & Muscle Center of Texas and Clinical Associate Professor of Medicine at Baylor College of Medicine in Houston, TX. He is also Adjunct Professor of Neurology at Kansas University Medical Center in Kansas City, Kansas. A panel of specialists walks you through the assessment of heel pain. Part 2 will review various diagnoses for heel pain. An update on the newest pharmacologic options to manage symptoms of PD. A new meta-analysis does not support dual-antiplatelet therapy, but monotherapy may help.